Both Sarah & I thank you from the bottom of our hearts. Your direction and advice made the day go extremely smoothly and let us be free to really “be” with our guests, rather than worrying about potential problems. Each of our guests attending, commented on the peaceful ambience at the ceremony. Without your professional approach and experience, I doubt that the event would have been as enjoyable as it was! I recommend Liz Hayes to any couple choosing to have a warm and inviting wedding ceremony with their loved ones. A Marriage in Australia can take place at any venue, and at any time and date of the couple’s choosing. The Marriage must be performed by a legally appointed Civil Marriage Celebrant or appropriate Religious Minister according to the Marriage Act 1961. Civil Marriage Celebrants are appointed by the Attorney General’s Office in Canberra. The Notice of Intended Marriage (NOIM) must be completed, signed, witnessed and lodged with the Celebrant not less than one month, and not more than 18 months prior to the wedding date. 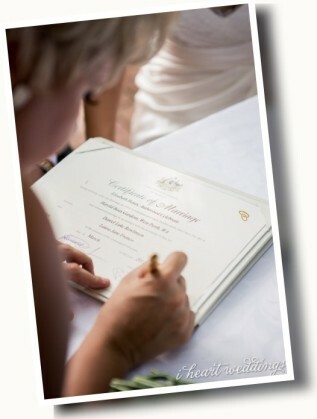 Australian Citizens – Official Birth Certificate obtained from the State Registry of Births, Deaths and Marriages. Non Australian Citizens – Official Birth Certificate from country of birth or a current Passport from country of birth. In the event that either party has been married previously, a decree absolute, or certificate of divorce must be provided. In the event of the death of a partner, a death certificate must be provided. If either party has changed their name, documents certifying this must be produced. The bride and groom must state the Minimum Legal Vows which must be audible to the witnesses and any others present. There must be two witnesses over the age of 18. The Notice of Intended Marriage form must be completed and in the Celebrant’s possession at least 1 month prior to the date of the ceremony. (This form is available in the Documents section of this website). An employee of the Commonwealth or an employee of the Australian Trade Commission authorised under paragraph 3(c) of the Consular Act 1955. A Notary Public (If you cannot get to an Australian Embassy or Consulate using the services of a Notary Public will make completion of the Notice of Intended Marriage Form easier to arrange).